If you live in or around the Fort Mill area and have any sort of tooth pain or discomfort, please contact Gold Hill Dentistry right away. Our dental practice offers emergency dental care and can make arrangements for you to be seen as soon as possible. Any sort of “twinges” of tooth pain should not be ignored even if they subside and reoccur and subside again. 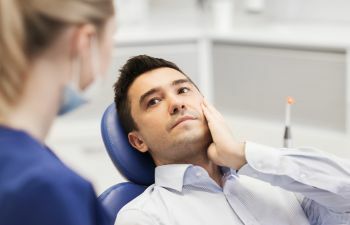 Any sort of dental pain is an indication of an underlying problem that can lead to serious infection if it is not addressed in a proper manner and time. In the event that your dental emergency is due to a blow to the teeth or jaw, please contact us right away or come into our office immediately. The sooner the emergency is addressed, the better chance it can be corrected. As with all emergencies, no one can plan for a dental emergency. Dental emergencies can be extremely painful, scary, and cause a huge disruption to your schedule. Dr. Kavi Sagunarthy and Dr. Jennifer Mokris are experienced, talented, and caring dentists who provide excellent care for your smile at all stages. We use only state-of-the-art dental equipment to provide the highest standard of dental care to our patients, and our entire practice is equipped to handle all types of dental emergencies – from minor chips to severe traumatic injuries. As a part of our compassionate dental care, we also offer sedation dentistry using nitrous oxide or oral sedation to ensure that your dental experience is as calm and painless as possible. Dental emergencies are as nerve wracking as any other type of emergency, and nerves are often stretched to their full capacity. Gold Hill Dentistry understands your needs, and we are here to restore your smile. If you need emergency dental care in Fort Mill or the surrounding communities, please contact Gold Hill Dentistry immediately. Your needs will be addressed in as timely a manner as possible to ensure that your smile remains beautiful and healthy. We want our patients out of pain and smiling again as soon as possible!